This article is a short summary of Super Mario Land. Super Mario Land is a game in the Super Mario series released as a launch title for the Game Boy in 1989, and then later released on the Virtual Console for the Nintendo 3DS in 2011. It was not developed by Shigeru Miyamoto and Nintendo EAD but rather Miyamoto's mentor and the Game Boy's creator Gunpei Yokoi, and his team, Nintendo R&D1. The game is notable for introducing the character of Princess Daisy, who would go on to appear in several games since. Super Mario Land would go on to spawn two sequels: Super Mario Land 2: 6 Golden Coins and Wario Land: Super Mario Land 3 (which would in turn spawn its own series). Super Mario Land was also the best-selling Game Boy game, with over 18.17 million units sold; the game was also the best-selling handheld Mario game until it was surpassed years later by both New Super Mario Bros. and Mario Kart DS. "Join Mario in a world of strange creatures! A beautiful kingdom on ancient ruins, tempestuous waters, and brand new challenges makes Super Mario Land the best ever!" "Relive Mario's greatest Game Boy adventure! Travel over land, in the air, and underwater. Mario makes his way through four treacherous worlds on his way to save the Princess!" "Ancient ruins, giant crabs, Koopa Troopas, flying stone heads, and hungry sharks await you in this rerelease of the 1989 Game Boy game. In the beautiful kingdom of Sarasaland, a mysterious alien has appeared and hypnotized the inhabitants while kidnapping Princess Daisy™ for himself! Ancient ruins, tempestuous waters, and brand new challenges await!" "Relive the madcap mayhem of Mario's very first Game Boy™ adventure! Ancient ruins, giant crabs, Koopa Troopas, flying stone heads, and hungry sharks await you in this re-release of the 1989 Game Boy game. In the beautiful kingdom of Sarasaland, a mysterious alien has appeared and hypnotized the inhabitants, while kidnapping Princess Daisy™ for himself. Travel over land, in the air, and underwater, as Mario runs, jumps, and bounces his way to fortune and glory on his mission to save Princess Daisy and restore peace. Ancient ruins, tempestuous waters, and brand new challenges await!" In the kingdom of Sarasaland, the alien Tatanga has appeared, hypnotizing the kingdom's inhabitants and kidnapping Princess Daisy to marry her. Mario must journey through the kingdom in order to save the princess from Tatanga. Super Mario Land generally plays similarly to past Mario platform games, most similarly to the original Super Mario Bros. Players control Mario as he journeys through four worlds of four stages each, not unlike Super Mario Bros. Said game's power-ups also return, though instead of the Fire Flower this game instead features a Flower that turns Mario into Superball Mario, allowing him to shoot Superballs that bounce off of walls. At the end of each stage, Mario can either exit through the bottom of a tower, or through the top which takes him to a bonus game to earn extra lives or a Flower. For certain stages, Mario can either travel through the sky in the Sky Pop plane or underwater in the Marine Pop submarine in a shooting stage. During these stages, Mario can move in all directions, and shoot using B.
Super Mario Land Game Boy (Player's Choice) 1996 A re-release of the game under the Player's Choice lineup. KOR: February 3, 2016 A direct port of the original game, with added Virtual Console features. 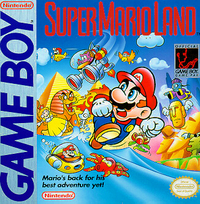 Super Mario Land was planned to be the Game Boy's pack-in game at launch until Henk Rogers convinced Nintendo of America president Minoru Arakawa that including Tetris instead would appeal to more players. ↑ Video Interview: Alexey Pajitnov Pt. 1. IGN (June 12, 2009). Retrieved June 19, 2015.